All NHS bodies in England, including CCGs and NHS trusts, are required by law to take account of the NHS Constitution in their decisions and actions. (Handbook p.3) The Constitution contains high level principles that are ‘rules’ governing how the NHS operates and seeks to achieve its purpose. It also contains values developed by patients (service users, in maternity), public and staff which seem to be aspirational words to make everyone feel good about collaborating to support the principles. Then there are rights, pledges and responsibilities, for both patients and staff. So how could this be done? Is there a mechanism for arranging broad-based, meaningful community involvement in maternity, with women, commissioners and others working together in equality, as contemplated by Transforming Participation, to co-design services? I have posted previously on this blog about what ‘MSLCs’ are, their rich history, and how they work: local, independent NHS working groups, providing advice. With a focus, too – where adequately resourced – on local action: see case studies here. An MSLC is constituted to advise on maternity commissioning, with equality of members. More representative and sustainable than simply having one or two local women attending a CCG or trust meeting: it is led by a lay person, should have one third service user members, and provides a mechanism for ongoing involvement and project work from year to year. There is training for members, succession planning, and regular liaison with a range of local stakeholder organisations. The lay chair typically manages outreach work by the volunteer members, with attention to planning and quality (which is supported by the national chairs’ and service user reps’ forum online). The MSLC chair should be invited to comment on the local maternity service specification annually – drawing on the feedback reviewed by the MSLC across the past year, including that collected by the service user group. An advisory role that surely makes a well-informed and valuable contribution to rational, evidence-based decision-taking. While not all areas have an MSLC currently, the movement is strong and growing, and has a new, modern face as an active presence (using the hashtag #mslc) in the #MatExp social media movement – e.g. here. The outreach programmes run by the volunteer MSLC service user members are typically geared to collect views from a diverse range of service users. Where the necessary, modest funding is provided by the CCG, this work can be supported and developed, with service user leadership (lay MSLC chairs undertake a significant and responsible public service role). A message to Commissioners: do you need more information about best practice, and the benefits of involvement and co-design? Service user led co-design and project work can fulfil promise of the NHS Constitution to involve local communities – but as the Berwick report foresaw (see notes below), this may need a shift in philosophy and leadership approach in NHS organisations: can you, whether a Commissioner or a healthcare professional, be part of making that change in maternity? What would the first step be? Where would you look for ideas and support? Patients and their carers should be present, powerful and involved at all levels of healthcare organisations from wards to the boards of Trusts. The patient voice should be heard and heeded at all times. Patient involvement means more than simply engaging people in a discussion about services. Involvement means having the patient voice heard at every level of the service, even when that voice is a whisper. Evidence shows that patient safety improves when patients are more involved in their care and have more control. Patient involvement is crucial to the delivery of appropriate, meaningful and safe healthcare and is essential at every stage of the care cycle: at the front line, at the interface between patient and clinician; at the organisational level; at the community level; and at the national level. The patient voice should also be heard during the commissioning of healthcare, during the training of healthcare personnel, and in the regulation of healthcare services. What does high quality, safe care look like? One suggestion is the WHO-preferred definition given in the Birthrights letter to the National Maternity Review. There are many other sources and resources – which MSLCs can look at together – including Better Births, the report published by the National Maternity Review, and NICE Maternity Guidance. This financial year, NHS England is required to expect CCGs to produce a plan to significantly improve choice in maternity (NHS mandate 2016/17 2.2, p. 13). There is much work to do to meet that requirement, complying with the NHS Constitution, and the recommendations of the Berwick report too, of course. Look to existing best practice, and take advantage of the energy, enthusiasm, knowledge and commitment of the multidisciplinary MSLCs in their regional and national networks by developing or founding one in your area. 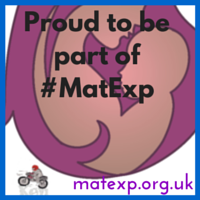 Join the national conversation online – #mslc #MatExp – and ask us for resources and ideas. All are welcome, and we look forward to learning from you – bring us your energy, enthusiasm, knowledge and commitment!